Mix Wheat flour along with salt and add enough water to make a thin batter. Add chopped onion, chillies and curry leaves to the batter. Heat tawa. Wipe it with oil. Mix the batter and add little water and make it slightly thinner than the idli batter. Pour one big ladle of batter in the tawa, starting from edge of the tawa and ending in the middle circlewise (like making rawa dosa). Pour a teaspoon of oil around the corners of the dosa. After it cooked oneside, flip it over and cook other side also. Remove it. Note: You can also add little maida and rice flour to get more crispy dosa. i liked most of all yr recipes and i have become yr fan for now. I will try some of the recipes and shall give u feedback. Thank you Mrs Suhasini soorian. Make sure the batter is not too thick or too thin. You cannot spread this dosa batter like ordinary batter. 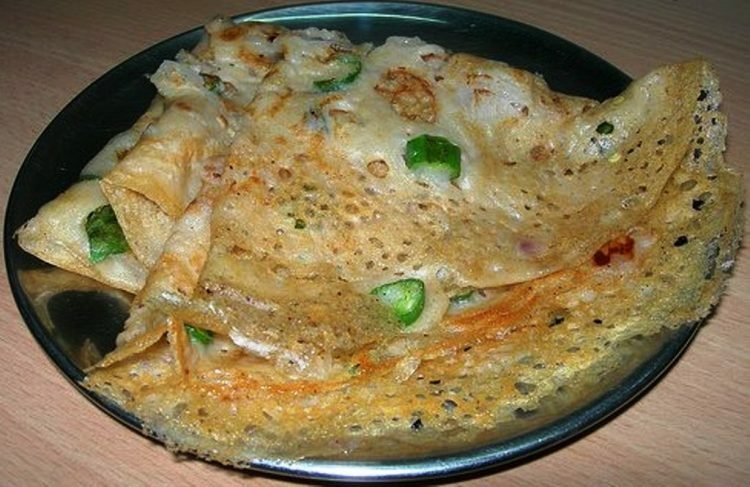 Hence make the batter slightly thinner than the ordinary dosa batter and make it like rawa dosa. Also you can wipe the dosa pan with little salt or with cut onion to avoid sticking. I recently found ur website and I have tried most of your recepies. All of them turned out well. My family loved your recepies. A big thank u to u and a Very Happy New Year. One small suggestion. My mother adds rosted jeeragam. It gives lovely taste. Yes. Like rawa dosa, I also used to add little jeeragam and whole pepper. I tried this ma’am. Came out very well.